The Super Bowl is the Super Bowl of commercials. For millions of viewers, interest in the game is dwarfed by the appeal of the ads; it’s the only event where the audience is actively looking forward to the commercial breaks. As always, this year’s spots included a ton of celebrity cameos, from a live Snickers commercial with Adam Driver to John Malkovich attempting to buy a new website. Some of the biggest music artists in the world also appeared in the ads. Check out some of our favorites below and click here for more coverage of Super Bowl LI. Justin Bieber teamed up with Terrell Owens and New England tight end/ bro culture poster boy Rob Gronkowski for this T-Mobile spot, which is an anthropological history of….we’re honestly not sure, the theme is pretty muddled in this one. 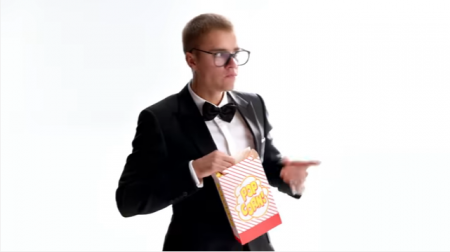 But hey, it’s the Biebs dancing around and acting all goofy, so millennials are gonna love it. One the best ads of the Super Bowl, this Justin Timberlake and Christopher Walken team up makes good use of whatever outrageous licensing fee Bai had to pay *NSYNC. This Nintendo spot appeals to two demographics: Nintendo nerds who are eagerly anticipating the release of the video game company’s new Switch system; and Imagine Dragons fans who are eagerly anticipating the release of new music from the band. But is there any overlap between the Nintendrones and Fire Breathers? After dropping $5 million for this spot, Nintendo certainly hopes so. Lady Gaga has been the musical face of Super Bowl LI, so it was a natural choice to feature her in the first ever Super Bowl ad from Tiffany & Co. The Super Bowl halftime performer talks about being a rebel and why it’s not pretentious to talk about art. She even plays a bit of harmonica to establish authenticity before she describes her hardscrabble New York upbringing. Missy Elliott (who has been hot on the Super Bowl circuit over the past few years) joins a cast of vaguely creepy looking talking celebrity yearbook photos in this spot for the Honda CRV. Jimmy Kimmel actually gets the biggest laugh, an impressive feat considering the commercial also features Tina Fey and Steve Carell. And finally, T-Mobile tapped America's new favorite odd couple, Snoop Dogg and Martha Stewart, for an ad that’s loaded with weed wordplay.